Relationships aren’t static. They’re always changing. Risa is now 14 years old and our relationship is definitely different these days. I’m not sure I like the change. She’s still active and enjoys training. I don’t do a lot with her in that regard since she’s retired and I feel she deserves to do what she wants. Also, she sharks treats out of my hands and it HURTS so there’s not a lot of incentive there. 😉 I still keep up with her physical therapy exercises almost every day and do some fun Nosework with her to keep her mind bright. She’s losing her hearing, though. Between that and an increasing desire to just do whatever she wants. . .it’s hard to have the same training relationship we once did. It also doesn’t help that she’s sore and getting over another bout of GI troubles. Besides her back (which will always be an issue), she’s developing some arthritis in her right elbow. As her vet so eloquently stated it, “It’s no good to have a flat tire in the front when you’ve already got too soft ones in the back.” 😉 I tried Adequan injections to marginal effect. I could see some improvement but nothing dramatic. I got some CBD oil to try but, due to her recent GI distress (yay for cleaning up poop in my house almost every day! 🙁 ), I haven’t had a chance to introduce it. I’ve finally gotten her gut to relax but I fear it’s only temporary. I’ve got her diet pretty restricted at this point in time. Beef, lentils, and green beans. I recently added back in beef heart and started liver two days ago (after about a week to a week and a half of a bland diet and her new diet). While her poops are better and there have been no accidents, she’s still itchy. She seems even itchier today after adding in the liver which makes me think that I’m never going to be able to feed her a balanced diet with so many restrictions. It makes me sad. I’ve enjoyed feeding her fresh foods for her entire life with me (five years on raw food and then seven on homecooked) but, if I have to switch to a veterinary-formulated kibble to make her belly happy, it’s what I’ll do. With her medical issues making her feel yucky, she’s been more reserved. She’s less interested in doing stuff which makes me sad. I sometimes forget to take the time to do things with her, too, because she doesn’t require as much of my time in that regard as Kyu does. He’s becoming a wonderful training partner and I’m really enjoying discovering how to motivate him and train him the skills he needs for dog sports. But it also makes me miss the relationship I had with Risa in the ring and training. The way she’d light up a room. Her helicopter tail broadcasting her happiness to the world. It’s just not the same anymore but I respect that she doesn’t always want to play. She’s made it clear that she doesn’t want to assist my classes anymore so I stopped taking her with me months ago. It still stresses her out to see me leave for a trial and not take her with me. Even though she gets super grumpy after spending a day locked in a crate. I also feel like sometimes all I do is get annoyed with her. She frequently yells at Kyu (whether he deserves it or not), has gotten very barky and demanding (especially about food), and is hard to effectively communicate with since she either ignores me or doesn’t hear me. I love her so deeply and I can’t imagine life without her. It’s hard to see her not feeling her best and acting more withdrawn at times. 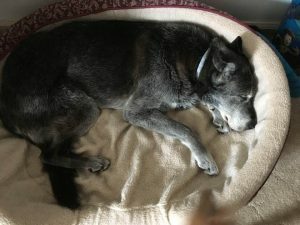 This entry was posted in Aging, Back Problems, Dog Food, GI Issues, Homecooked, IVDD, Nosework, Thoughts. Bookmark the permalink.